10 months have passed since the Iwama group left the Aikikai Federation and became an independent group. It gives me great pleasure to tell all our members that I have been developing my activities slowly but surely with confident steps. In this letter, I would like to thank, from the bottom of my heart, all of you who have been constantly supporting me and offering me your sincere collaborations. 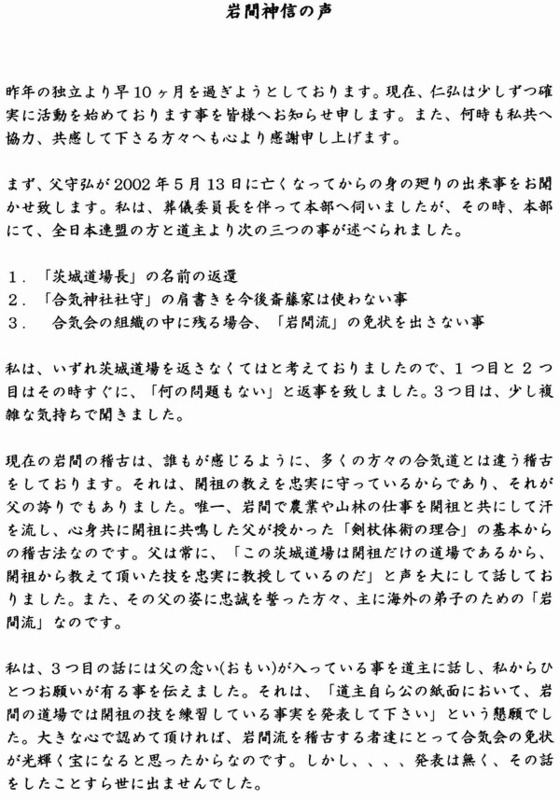 First of all, I would like to tell you about what happened after my father, Morihiro Saito, died on May 13th 2002. I visited the head office of the Aikikai Federation together with the chairperson of the committee of the official funeral ceremony for my father, and we had a meeting with Doshu and another person from the All Japan Aikido Federation. To return the name of "Ibaraki Dojocho" to the Aikikai. That the Saito family will cease to use the title of "the Aiki Shrine Caretaker"
That we will stop conferring the Iwama-ryu certificates, if we remain inside the Aikikai Federation. I had already been thinking that I should return the Ibaraki dojo in the near future so I replied immediately that there was no problem in agreeing to the first and second requests. However, I was a little perplexed about their third request. As everyone knows, the training we presently do at Iwama, is different from the training held at many other aikido dojos. This is because we have faithfully preserved the Founder's teachings and my father was always very proud of this. This training is based on the principle of the union of Ken, Tai-jutsu and Jo and was transmitted only to my father. My father dedicated his whole life to working with the Founder in the fields and woods, helping him with farming and taking care of trees. He served the Founder in full resonance, literally offering his body and soul. 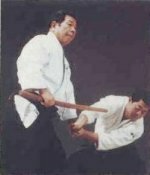 He used to say, " I am teaching sincerely the techniques taught to me by the Founder because this Ibaraki dojo belongs to the Founder alone". The Iwama-ryu group with its own grading system was created for those who were touched by my father's way of living and who chose to follow him as their teacher. These grades were mostly given to his students outside of Japan. Therefore my answer to Doshu regarding the third matter was that it was my father's wish to preserve the Iwama-ryu and I asked him to do one thing in return for my acceptance of his request. 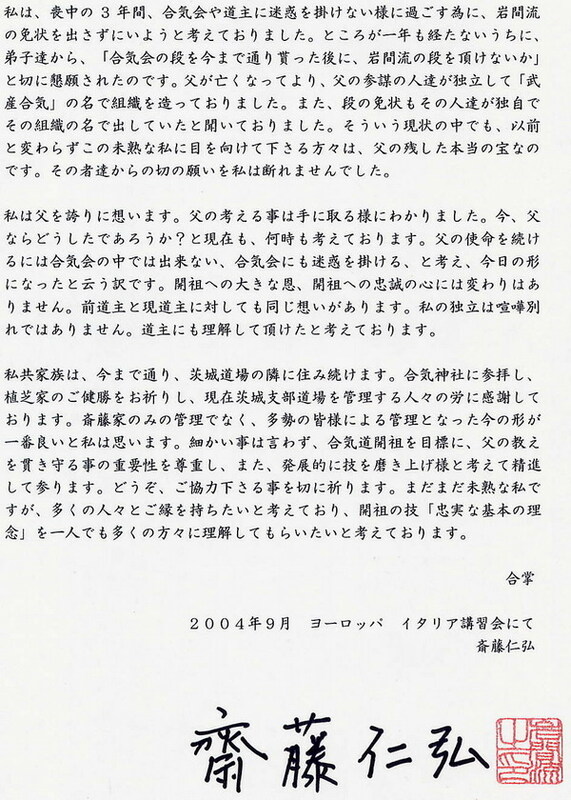 This was to announce in their official newsletter that Iwama-ryu is practicing the Founder's aikido. If the Aikikai could show their recognition and acceptance of us, I thought, then the Aikikai certificates would become a shining treasure for all the students of the Iwama-ryu. However, this did not happen and no one in the Aikikai Federation was informed that this meeting between the Aikikai and us took place. I thought I should not bother the Aikikai Federation or Doshu with the question of the Iwama-ryu during the mourning period of three years for my father, so I was not planning to give out any Iwama-ryu certificate. However, after less than one year, my students began to ask me, after receiving the Aikikai certificates, to give them the Iwama-ryu certificate as well. After my father passed away, the elder students of my father wanted to become independent and founded their own organization with the name of "Takemusu Aiki". They also started to give out their own certificates to their students. In this situation when a split was happening inside our group, there were still many students who chose to follow me in the same way as they followed my father. They are the true treasure my father left for me. Therefore, when I was asked to give the Iwama-ryu certificates, I could not refuse their request. We, the Saito family, will continue to live next to the Ibaraki dojo. We offer our prayer at the Aiki Shrine and wish the Ueshiba family good health. We feel grateful to the people who are now taking care of the Ibaraki Shibu Dojo. 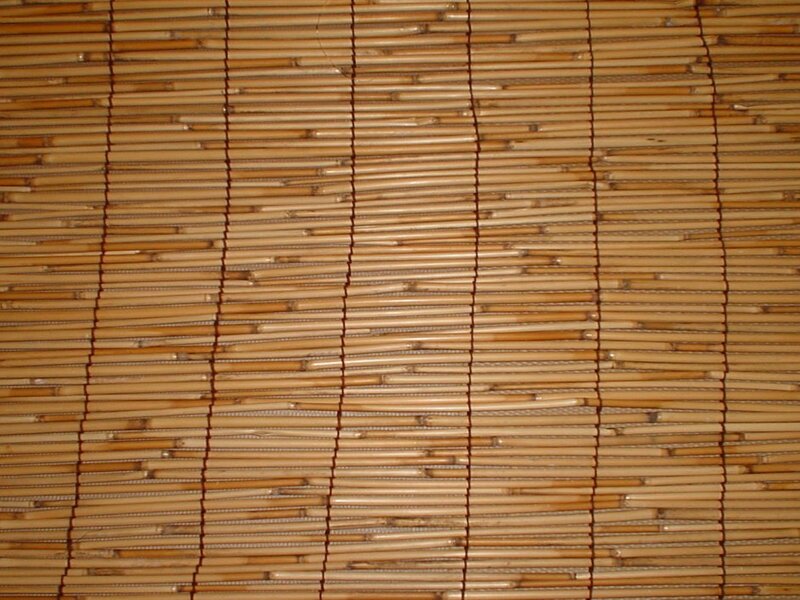 I think it is the best way that many people share the task of taking care of the Aiki Shrine and the dojo. I will continue to elevate and improve myself, maturing and developing the aikido techniques. At the same time I will continue to follow the Founder and dedicate myself to preserving the teachings of my father. I deeply wish to work with you, and I would like to meet and connect with many people. It is my sincere desire to help as many people as possible to understand "the principle of the true basic techniques" of the Founder.